The majority of the documents in this collection deal with The Hundred Days ( les Cent-Jours ) , sometimes known as the Hundred Days of Napoleon or Napoleon's Hundred Days, marking the period between Napoleon's return from exile on the island of Elba to Paris on 20 March 1815 and the second restoration of King Louis XVIII on 8 July 1815 (a period of 111 days). This period saw the War of the Seventh Coalition, and includes the Waterloo Campaign, the Neapolitan War as well as several other minor campaigns. The phrase les Cent Jours (the hundred days) was first used by the prefect of Paris, Gaspard, comte de Chabrol, in his speech welcoming the king back to Paris on 8 July. Provenance: This collection comes from the 80,000 volume library of the Royal Ernst August Fideicomiss library ( House of Hanover ) auctioned in 1970 and February 1971 in Hamburg at Dr. Ernst Hauswedell & Co., lot 2891, the 2-volume catalogue of this auction is also included. The collection is kept in the original carton folder marked: � aus dem Jahre 1815 � Proklamationen u. Zeitungsnummern�. In pencil the auction number Nd. 2891. DIE KÖNIGLICHE ERNST AUGUST FIDEICOMMISS-BIBLIOTHEK - KATALOG - 2 TEILE 3440 Nummern. Die Königliche Ernst August Fiedeicommiss-Bibliothek/ Hannover,. Auktion 174 und 177. 2 Tle. in 2 Bänden. Hamburg, Hauswedell, 10.- 12 Februar 1971. Kartoniert, 8°; zahlr. Tafelabbildungen. 208, 350 S., + ERGEBNISLISTE. Teil I mit 2050 Nummern, / 2 volumes, many illustrations. Verordnung über die Bildung des General-Gouvernements der heiligen Länder. 320 x 200 mm. The Generalgouvernement Berg was a pro visional government from 25th November 1813 to 15th June 1815 after the resolution of the Grand duchy of Berg instituted by the allies. It covered the area of the Duchy of Berg till 1806 and Gimborn, Homburg and Wildenburg. 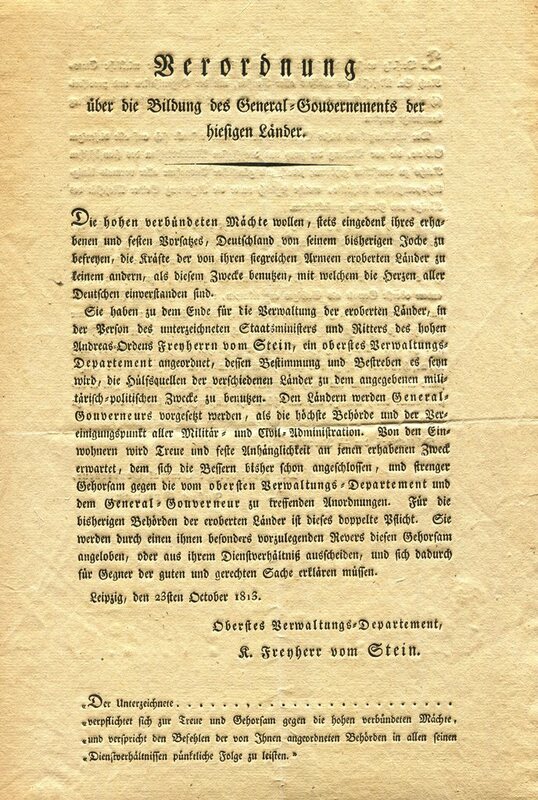 Front page: Leipzig, den 23sten Oktober 1813. Oberstes Verwaltungs-Departement. K. Freyherr vom Stein. Heinrich Friedrich Karl Reichsfreiherr vom und zum Stein ( 1757 � 1831), commonly known as Baron vom Stein, was a Prussian statesman who introduced the Prussian reforms that paved the way for the unification of Germany. He promoted the abolition of serfdom, with indemnification to territorial lords; subjection of the nobles to manorial imposts; and the establishment of a modern municipal system. After it became known that he had written a letter in which he criticized Napoleon, Stein was obliged to resign which he did on 24 November 1808, and retired to the Austrian Empire, from which he was summoned to the Russian Empire by Tsar Alexander I in 1812. After the Battle of Leipzig in 1813, Stein became head of the council for the administration of the re-conquered German countries. 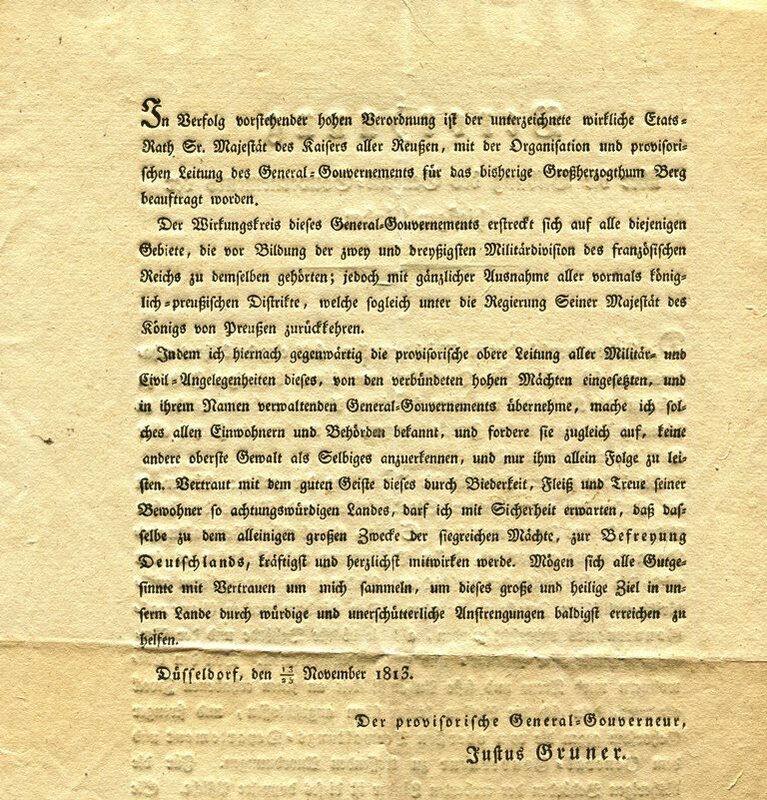 Staats = und Gelehrten Zeitung des hamburgischen unpartheyischen Correspondenten Anno 1815 No. 89 (Am Dienstage, den 6. Junii ) 8pp. 230 x 190 mm. Der Hamburgische Correspondent was the first Hamburg regular newspaper founded by Hermann Heinrich Hollen in 1712 initially entitled Holsteinischer Zeitungscorrespondent. From 1721 he issued this again as the Holsteinischer Correspondent and from 1724 it was called Hamburgischer Correspondent. It was the mose widely read and important European newspaper. It gives amongst others the names of those on Napoleon's side. �to be read to every battalion � You have performed great things, brave comrades�..
Army notification from general Count von Gneisenau sent from the head quarters at Merbes-le-Chateu, 20th June 1815 by order of field marshall Blücher. On how Napoleon started the battle on 15th June. Full descriptions of army movements, the battle near Ligny on 16th June, the march to Tilly. This battle was lost by the Prussians. The battle of 18th June and gradually the overall victory. To celebrate the unity between the British and Prussian nations Blücher ordered this battle to be called the Belle Alliance. The Prince of Orange has arrived in Brussels, the evening before around 8 PM he was hit by a bullet in his left arm, but he is in no danger. The Duke of Wellington has been victorious, the victory is complete. Both armies are pursuing the enemy. Wellington said that he had never fought a similar battle before and that the army had been very courageous, 150 pieces of artillery had been captured on his side and 60 by Marshall Blücher. The people of Brussels were of great help helping the wounded. Marshall Blücher will soon reach Charleroi. His Royal Highnes ([the prince of Orange) is feeling better. The Duke of Wellington arrived in Brussels . The remnants of the enemy armies have fled in great disorder and have left an astounding number of artillery pieces and all luggage. They are pursued everywhere. Marshall Blücher has reported to the King of Prussia that he has also captured Buonaparte�s field equipage and Jerome�s coach. De French general Van Damme has been captured by the Prussians near Wavre. Also Count Lohau, commander of the French reserves, who confirmed that the battle had been totally lost. PROCLAMATION . Le Prince Blücher aux braves Belges / PROCLAMATIE de Prins Blücher aan de brave Belgen. 420 x 360 mm. Merbes-le-Château, 21st June 1815. Le Maréchal; Prince De Blücher / De veldmaarschalk Prins Van Blücher. Blücher thanks the Belgians when his army is about to leave their country to go into France. General Fagel reports on 3rd July that Paris has capitulated and that one of the condtions of the capitulation is that the French army will retreat behind the Loire. Capitulation of Paris now ratified. Before that the move by the Prussian army to St. Germain and the Seine led to heavy fighting, Versailles was taken by the Prussians and then re-taken by the French. On 2nd July the Prussian army took Versailles again and then moved to Paris immediately. The French fought hard under marshal Davoust but the sight of Paris encouraged the Prussians greatly . the army corps under �Ziethen� conquered all positions by bayonet. After the capitulation the French army had to leave Paris and retreat to the southern shore of the Loire. On 6th July the armies of Wellington and Blücher occupied Paris. They were expecting the Russian emperor and the King of Prussia. Buonaparte had already left for Rochefort with his generals Savary, Bertrand and Labedoyère. Once committed to the battle, withdrawing in the face of a major hit against the center and then an attack on the flank would have been a good position for Blücher to be in. Also, with Napoleon wanting to keep the allied armies separate, this would have, in addition to possibly not succeeding, put more space between them.